I can hardly believe that my yellow Labrador, Sanchez, is now 13 years old. I count my blessings that he is in good health and still enjoys our twice daily walks. But, I’m also aware that he can’t keep up to his activity level from even a year ago, let alone in his prime. I’m always looking for ways to provide mental stimulation to his environment without physically taxing his body. It’s not always easy having a multi-dog household. But, it’s important to make a priority of having time alone with your pets daily. Since Sanchez was an only dog for the first seven years of his life, he particularly appreciates this. Walks do take longer (walking Gina separately), but it’s well worth the time when I see Sanchez’s smile of contentment. Dogs love to learn, no matter their age. I still spend time training every night with Sanchez. If it gets late, he starts whining and begging for his training time with me. The bonding time is precious and it stimulates him to keep learning and being challenged. He has no complaints about his yummy rewards either. Dog training should always be fun for both 4- and 2-leggeds. 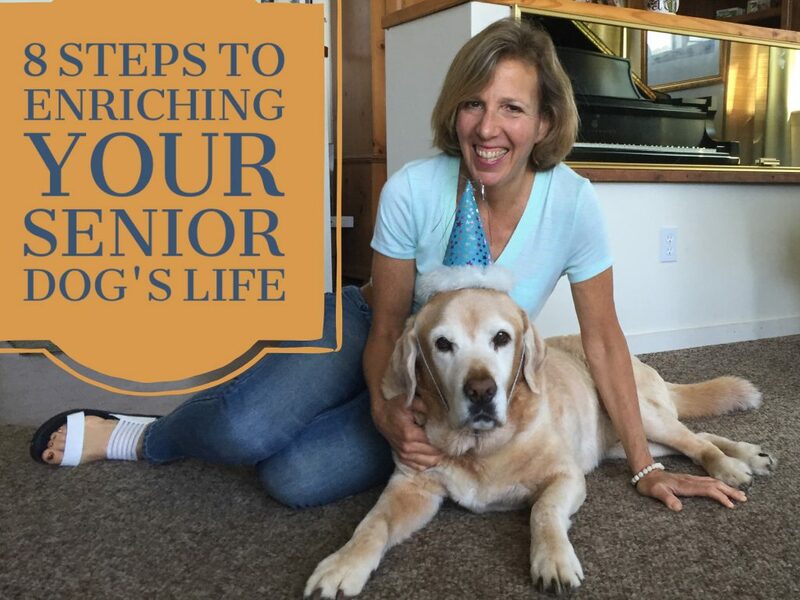 Get creative with your senior pup. Because you can teach an old dog new tricks. Gina is a high-drive dog. We spend a lot of time in agility training, along with retrieving and tugging at home. While it helps alleviate her pent up energy, Sanchez used to look neglected when she was getting the extra attention. So, I started sneaking him small treats while tugging with her. At night time, I often play ball with her inside, having her run down and up the stairs, chasing and retrieving the ball. I include Sanchez in the game by discreetly tossing him small treats while she’s running back up to me to deliver the ball. It not only makes him feel included, but it also engages his senses as his nose has to search for the tossed treat. In the video above, I am training both of my dogs together. Even though Gina is doing all the physical activity, Sanchez is getting equally paid for staying calm and still while she jumps over and goes under him. Good boy, Sanchez! It’s not unusual for senior dogs to develop anxiety issues later in life that seemingly come out of nowhere. They can include sound phobias, separation anxiety or resource guarding. There are some that I just accept, such as tearing tissue out of the bathroom waste basket. I call it his puppy behavior returned. I just make sure that I don’t put anything in the trash that could be harmful when chewed. Other behaviors will only get worse if ignored, such as separation anxiety or food resource guarding. Ignored, they will only escalate.Tips for Separation Anxiety are here. Sanchez and I used to enjoy musical freestyle classes. He would weave between my legs, spin and jump on my arm on cue. While that would be too taxing on his body now, we have kept in what is safe for him. He still loves to “go back,” lift his left and right paw on cue, and show off his “downward dog.” Of course, he is well paid for his behavior. National Association of Canine Scent Work (NACSW™) is the official sanctioning and organizing body for the sport of K9 Nose Work. It is a growing popular sport, and it’s great for dogs of all ages. K9 Nose Work is built on scent work where dogs use their nose to search for their prize. Sanchez loved his K9 Nose Work class. Now, at home, I put pieces of liver into a mixed variety of cardboard boxes. He is told to “find” the liver. Boy, does his tail ever wag when he is searching! Most senior dogs don’t have the same tolerance for noise they used to in their youth. The immune system of a senior dog is often heavily taxed. A natural reaction is to self-limit the amount of auditory or visual stimulation coming into the system. That is why senior dogs will often shut down in overstimulating sound environments. Music to Comfort Your Elderly Canine has also been helpful for pain management with senior dogs and night-time restlessness. As you can see Sanchez loves his iCalmDog. The Elderly Canine pet tunes playing on it provided great comfort for Sanchez (and me) when he was recovering from a slipped disc in his neck. 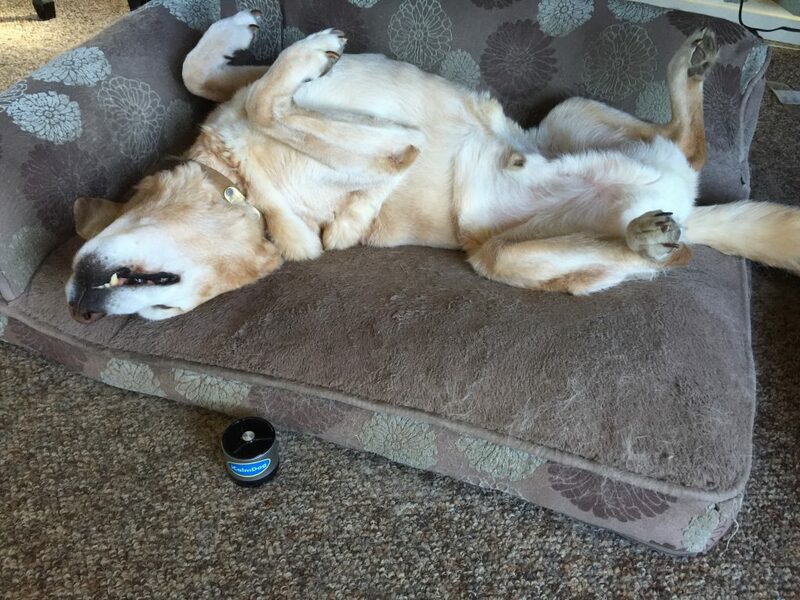 What enrichment activities have benefited your senior dogs? Thanks for adding your stories in a comment below. And, if you missed Sanchez’s 13th birthday May 17, here is a short video clip I put together of wonderful memories together. Next post: Do You Celebrate Your Dog’s Birthday or Gotcha Day? Sanchez has the same birthday as m3! No wonder I think he’s such a cutie! Happy Belated Birthday fellow birthday celebrant! Happy Birthday Karen! I hope you had a great day. Good to know that Sanchez and you share the same birthday. I always love your posts! Thanks for the tips which I need and will go practice now for my aging dog ‘jenny’, http://www.facebook.com/jennyinservice. Your post tickled my brain by connecting with a post about raising kids and managing people, I see parallels with what you’re saying in raising dogs, having a multi-dog/kid family, and dealing with change as we all grow, yet not abandoning what’s good for us to always develop and live a full life.